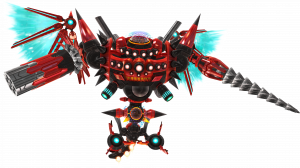 The Egg Dragoon makes its grand return as a boss battle in Sonic Generations. 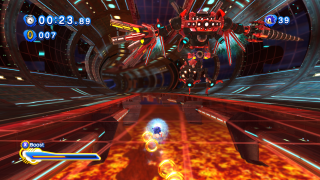 The fight takes place in a large tunnel presumably in or near the city of Eggmanland from Sonic Unleashed, where the original battle took place. While Sonic took on this mech before in his Werehog form, this time Sonic fights Eggman with his normal blue self, and the mech's battle style has changed to compensate for it. He can fire Ice shards (the previous battle his Ice Bomb) at Sonic while he is running. His drill can be fired at Sonic like a homing missile. Instead of electric shock waves, he has a laser gun which fires multiple lasers across the tunnel for you to leap over. When you are grinding, he fires actual missiles at you. Sometimes, he will trap you inside two large walls and try to smash you with ice shards falling from the top to keep you in. You need to Wall Jump up these walls, dodging the ice to the top, where you can hit him again. Eventually, he will go through what seems to be a Time Eater warp, which will make you skydive down a large shaft fighting the mech like in the original fight. Dodge his drill attacks this way, and you can hit him again if you get close enough. At the end of the battle, the Dragoon falls to pieces in the shaft, and with the fight over you earn yet another Chaos Emerald. After the battle, Eggman reveals that he SHOULD have won this time. Modern Tails wonders why Eggman is here despite having supposedly been kidnapped earlier. At this point, the Time Eater grabs the doctor and pulls him into the void. If a mod is used to enable Sonic the Werehog he is invisible at the cutscene before this boss battle. This page was last edited on 31 July 2018, at 07:44.